For this Oven Roasted Salmon Recipe I urge you to use wild salmon. In fact, I recommend wild seafood for all these restaurant seafood recipes. 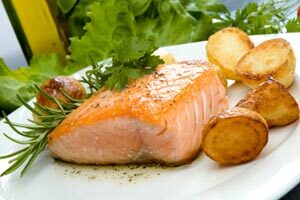 More specifically for salmon, I almost always recommend using wild King or Sockeye salmon. That is what the restaurant guests enjoy and I believe that is one reason I sell a great deal of it. Fresh frozen simply means the salmon was processed within an hour or two of being harvested. This process allows us to have quality salmon year around. 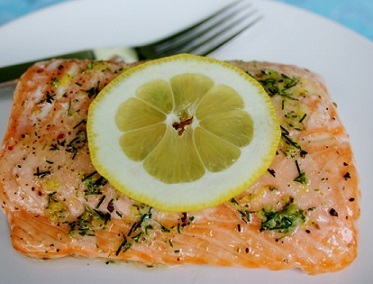 This restaurant salmon recipe is very good it is also quick to prepare. All of us need fast and easy recipes for certain times, but you deserve quality as well. With these restaurant recipes ...you get both! The recipes on this website represent over 30 years of work, testing and improving each one until each could easily pass the ultimate test ...paying restaurant customers that order the meal over and over again! Preparation time: about 10 minutes. Serves 4. 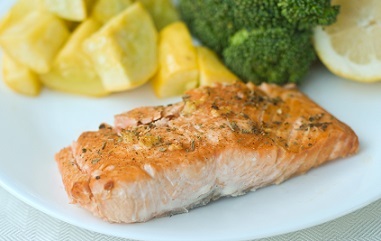 A favorite restaurant recipe for wild salmon! Thanks for 'clickin’ on the website. ENJOY your salmon and the other restaurant recipes on the website and the company of those you share them with! "When you feel neglected, think of the female salmon who lays 3,000,000 eggs but no one remembers her on Mother's Day."